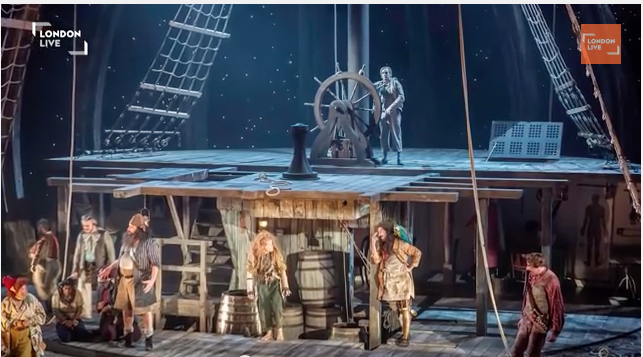 Scene from the National Theater’s current production of “Treasure Island,” which is being broadcast live around the world on Jan. 22. 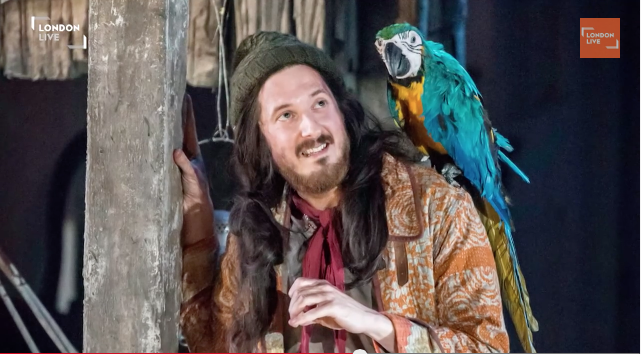 The National Theatre’s Christmas production of Robert Louis Stevenson’s “Treasure Island” will be broadcast around the U.S. Thursday, Jan. 22, and looks like an event not to be missed. Click here to watch the trailer. Yep, not just movies have trailers these days. Click here to see a photo gallery from the show. My kids (ages 24 and 21) will be at Monmouth University, West Long Branch, NJ, to see it. Tickets are $22. The show is suitable for kids age 10 and older. It is a 7 o’clock curtain, but it is also a school night. That’s unfortunate. I have invited a 13-year-old theater lover to join us. Just waiting to see what his mom says. We’ve seen about 10 NTL events at Monmouth U and never been disappointed. My 21-year-old son says he really enjoys the various camera angles and close-ups that give American viewers an experience the folks in the seats in London don’t even get. Click here for the National Theatre Live website, then click on “Find a Venue” at the top, to find a theater near you. To hear the actors and creative staff talk about the show click here.